It’s a wet and windy morning here in Yorkshire, which means it is perfect weather for me to write part 2 of my Google Analytics guide. In part 1 I showed you why Google Analytics is so cool, and I gave you some very basic instructions on how to set it up on your website. In part deux, I’m going to give you a comprehensive step by step guide, showing you how to use Google Analytics to track your e-commerce transactions. Before I start let me just give you a quick run-down about the different “goals” and e-commerce tracking options, depending on your site some of the guide might not apply to you. In this example, as well as setting up basic tracking so I can see what the conversion rate for my product is, I’m also going to be setting some goals. Goals can be used for any number of things, you could have a goal set up to see how many visitors sign-up to your newsletter through your opt-in form, or you could use it to see how many people go through your shopping cart and go on to make a purchase. 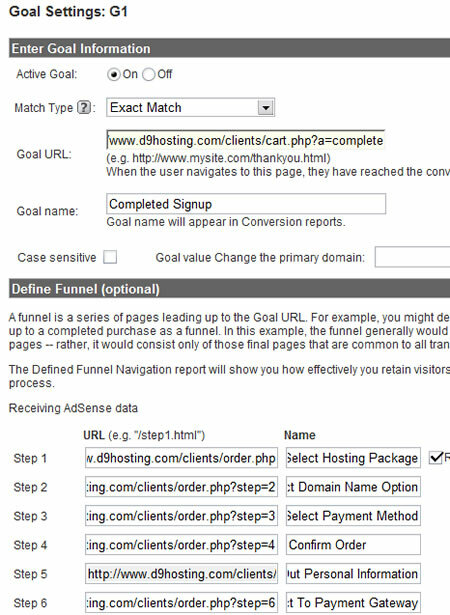 In my example I’ll be showing you how I use Goals to track how many customers make it through the D9 Hosting shopping cart! Don’t worry if it isn’t making sense, it should all start to come together when you read the guide. So with that out of the way, let’s get started! This is a nice easy start for you, if you already have an Analytics account then simply log in to your dashboard (admin) area. If you don’t yet have an account then you’ll need to sign-up first – it’s free! Next we need to create a profile for the website that you wish to generate the stats for. With you now logged into your dashboard, click on the “Add Website Profile” link. You then need to fill out the small form with the details of your website, it’s all very straightforward but I’ve added a screenshot showing you my settings if you need to use them as a guide. When you have entered all of the information, click on the “Continue” button. Moving swiftly on to step 3 and one of the most important parts of the process – The Tracking Code! You are presented with 2 types of tracking code, Legacy and New. I prefer using the New tracking code as it helps get your site ready for any future Analytics features that wouldn’t be available if you were using the old code. After you have copied the code, click on the “Finish” button. Don’t worry if you lose the code, you can always retrieve it later! Next we need to add the code that we just copied in Step 3 to EVERY page we wish to track – this should be every page on your website, not just the home page! You should paste in the code just before your closing </body> tag in your HTML source code. 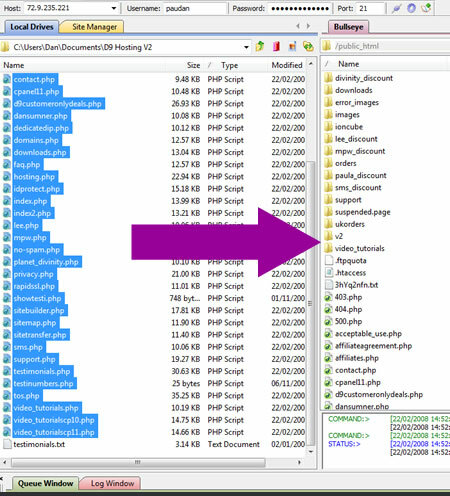 **The google tracking code here** </body>When you have added the tracking code to all of your pages, you then need to upload the pages to your web space. If you then go back into your Google Analytics account and look at the Status of your tracking code, you should see a “Tracking code installed” message next to your website profile. If you don’t see this message try again in a few minutes, if you still see errors after a few minutes you need to double check you have pasted the tracking code into your pages correctly. With the tracking code installed, we need to then tell Analytics that our site is an e-commerce website and that we wish to track sales and conversion rates! To do this, click on the “Edit” link that appears next to your website profile. 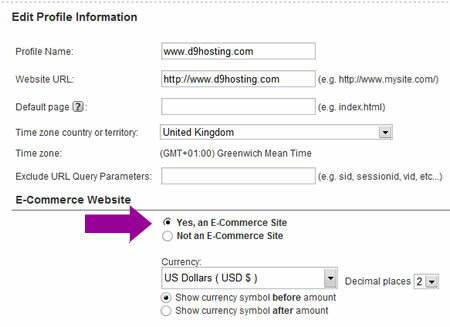 You will then see a set of e-commerce options that you can edit, make sure you select “Yes, this is an e-commerce website” and that you select the correct currency that your site sells items in. When you are done, click on finish. I am now moving onto “Goals”. If you only have a 1 page website and just want to track sales, you can skip to part 7! One of the things I wish to track is the effectiveness of the shopping cart. The cart is made up of multiple stages, part 1 you select the hosting package, part 2 you select the domain name and so on. Setting up goals allows me to track visitors as they go through the different steps, it also shows me if the abandon the cart, and at which point they abandon. If a lot of people abandon the cart at the same stage, I know there is a problem and I need to take a closer look! You will then be presented with a screen asking you to input your goal details. Your funnel URL’s will obviously be different to mine but as long as you get the URL’s in the correct order you shouldn’t have any problems! When you are happy with the settings, click on the Finish button and you are done, wasn’t so bad was it? The final step for setting up e-commerce tracking is to add some extra code to our “Thankyou” or “Download” page, in simple terms this is the page that the users gets sent to after they purchase your item/s. You should already have the default tracking code installed on this page, but you also need to add an extra bit of code, this allows you to enter the sale amount, the order ID and so on. *Please don’t copy/paste the above code, copy it from Google instead. WordPress tends to make a mess when you copy/paste code. 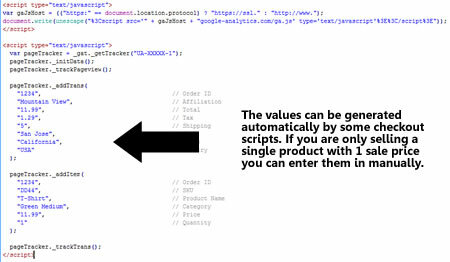 If you are only selling 1 product then you can enter the values manually, if you are using a shopping cart you should be able to use it to pass the details into the Analytics tracking code. Please contact your script vendor if you are unsure about how to do this. That brings to an end this guide, Analytics usually takes around 24 hours to update so you’ll have to wait until this time tomorrow to see your results, but once you have everything set up correctly it’s a great resource for any webmaster to use! Thanks for reading, and I hope you have found it useful. Forget Chocolates, Try Another Kind Of Optimization! juicy info for you today. project currently called “Website X”. 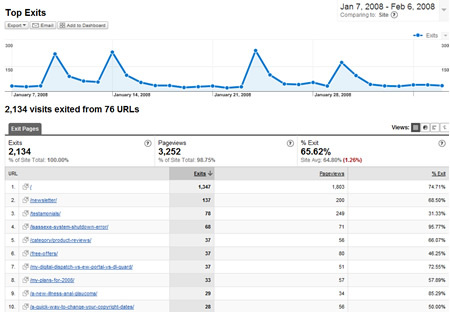 My Website X’s Generate 99% Of Their Traffic From Search Engines! but Google, Yahoo and MSN! isn’t currently on your list of priorities then WHY isn’t it? I honestly think you should be doing the same. traffic for the coming months and years! going back to your guide for clarification. the book when I needed it for clarification. your sites into the search engines, but to keep them there as well! copy of SEO Made Easy to complement the new eBook! Greetings everyone, welcome to another newsletter. Although why I still call them “Newsletters” is anyone’s guess, I think I’m going to have to rename them to “Mildly interesting postings from a bit of a geek that seem to arrive in your inbox every now and again”. So with that in mind, welcome to my very first mildly interesting post….from a bit of a geek. In this edition I’ll show you exactly how you can set up a detailed tracking system, without spending a single penny! Your web host will no doubt already offer you a basic statistics package, this will show you the number of visitors, where they came from, what browser they were using and so on, but like dog with worms, we are hungry for MORE! 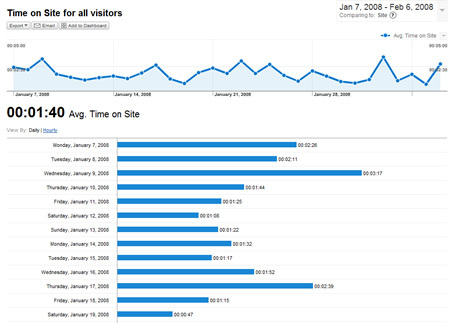 We need to know how long the visitor spent on our site, which pages they visited, which pages they left the site on, why did they leave the site, we can even find out the type of internet connection they used when they visited our website. It might be a bit difficult for you to see, but it shows every page and the number of people that exited the site when they visited that page. Mine looks fairly normal, but let’s say that you have a page that has a very high exit rate. You can then look at that page in detail to try and find out why people are leaving it, you can then tweak the page until the exit rate goes down! The average time people spend on this blog is currently 1 minute and 40 seconds. This is a very good sign, if people spend more than 10 seconds on your site then they must be interested in the content. If the average time people spend on your site is less than 10 seconds then you need to think about changing something! Not only does it show me the average time you spend on the site, but it also breaks it down, day by day. On certain days, the average time jumps up to over 3 minutes. It’s no co-incidence that these days are when I make a new “Mildly interesting post”, not only does it show me that you are clicking on the link to view the latest post, it also shows that you are actually reading them! I’ve just reached a full page in my word processor, and I’ haven’t even told you what stats package I’m talking about, and I haven’t shown you how to install it yet. I’m going to jump into that now, I could keep going on about the hundreds of cool features but I’d still be here this time next week. 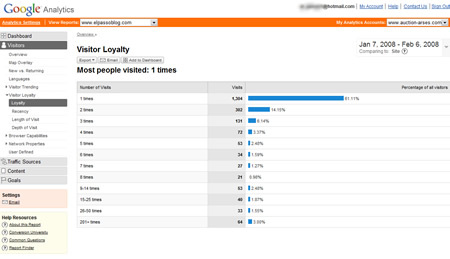 Those of you with eyes will have already seen the name on the screen shots – “Google Analytics”. When you sign up, the first thing you need to do is set up a new website profile. 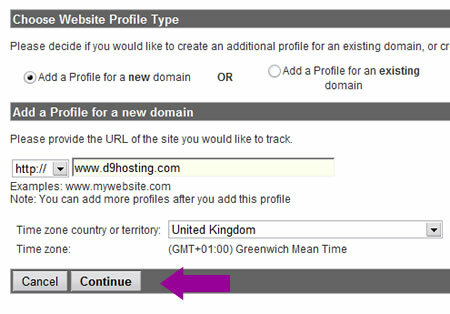 Click on the “Create new profile” button and it will ask you for details of your site, fill out the form and you will be done in no time. 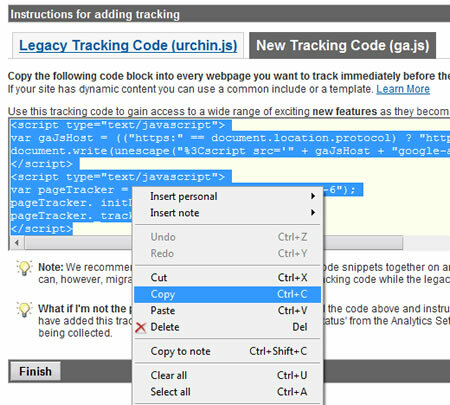 All you need to do then is copy/paste the tracking code onto the pages you wish google to track for you. If you are using a WordPress blog like this one, you just need to insert the tracking code in either the header, or the footer file and it will track every page of your blog. When you have inserted the code, your stats will be updated by Google every 24 hours, and that’s it – easy as pie! However…..Google Analytics also let’s you track e-commerce transactions, this let’s you follow the website visitor all the way through your website order process from start, to finish. Analytics can even record the sale data, this can then produce a wide variety of reports including the conversion rate of your site, the amount of $$$ you are earning per visitor and much more. This is slightly more tricky to set up, but I would be happy to put together a step by step guide if any of you would be interested? Let me know by posting a comment, if enough of you are interested I’ll make it into another “Mildly interesting post”!